When I was shopping for inspiration last Fall, this Elie Tahari Lauren Long Sleeve Dress caught my eye. 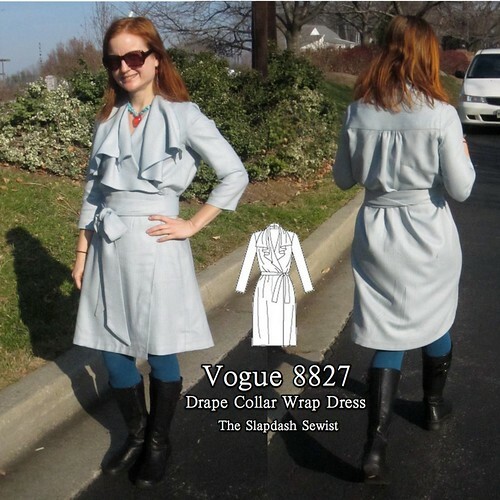 I love the volume in the collar and the wrap shape is ever-appealing. When Vogue 8827 was issued earlier this year, I was excited to see a pattern for this inspiration piece and bought it right away. It's quite a fabric hog and I didn't have too many pieces large enough. I decided to go for this lightweight wool purchased at Guss Woolens in Baltimore ($20 for the piece, about 2 2/3 yard) at a sewing meetup in February of this year. I knew I was taking a risk with the color and the volume. This could very easily have come out looking like a nightgown. However, I think my gamble paid off--this is a great dress! The only alteration I did to the pattern was a slight Small Bust Adjustment, shortening the front crossover/collar drape a bit by folding some length out. The back is drafted with a yoke, and then the lower back is voluminous and gathered into the yoke. I figured that would take care of my broad back needs as it is broad near the base of the shoulderblades. It does, though I feel a tiny bit of restriction in my arm movements. Not enough to actually affect my range of motion; I think it's just that I'm so used to unlimited room to move that it feels restricted. I also did not do a swayback adjustment. The voluminous back is not really compatible with any center back contour (and adding a CB seam would have made the gathering more difficult). The tie means that any extra fabric in the back over the swayback can be bloused above where the belt wraps around. I was most concerned about this gamble, and whether the voluminous back would be sloppy/overwhelming. I considered changing to a plain back, but decided to give the pattern a shot as drafted, but I think the design is nice in the end. Part of the reason the pattern requires a huge volume of fabric is that the collar/flounce is meant to be faced My fabric looks the same from both sides, and I wanted to take advantage of that, as well as maintain the maximum possible drape on the flounce. Figuring out how to do everything required a bit of thinking about right side/wrong side. 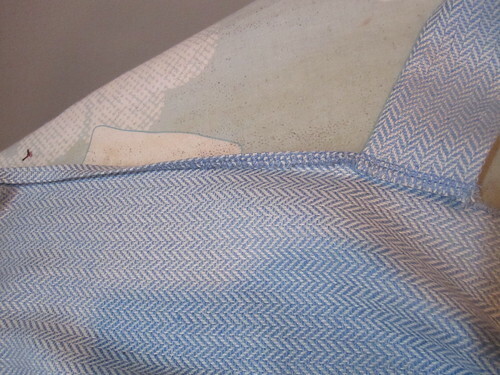 The wrong side will be the right side on the flounce (which extends to become the back collar), so the serger rolled hem needed to be done wrong-side-up, and the back collar seam needs to be sewn wrong sides together. To make sure I had the proper side, I marked the wrong side of the fabric with a bit of tissue paper. First, I trimmed away the seam allowance on the front opening edge above the waist, where the ties would be attached, then did a serger rolled hem above the waist (with the wrong side of the fabric up, as mentioned). To ensure that the back collar edges would meet perfectly, I hand-tacked the rolled hem edges together, and then stitched the center back collar seam, which is cut in one with the front piece, wrong sides together. 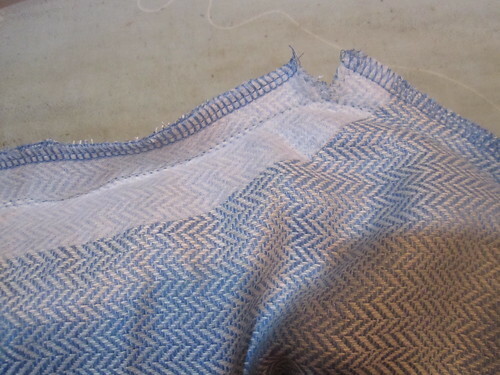 To form the flat fell seam, I trimmed one side of the seam allowance, then folded the full-length side over the short side. 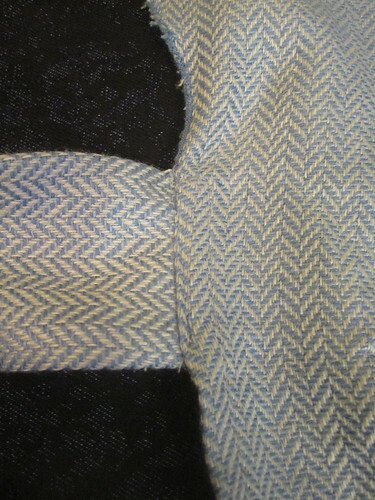 The photo illustrates how the longer seam allowance folds over the shorter. Everything is actually pressed to the side. 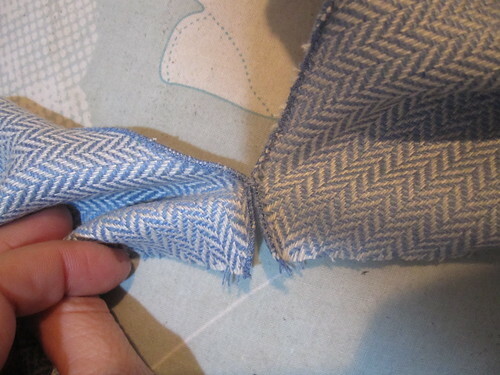 Once it was folded, pressed, and pinned into place, I topstitched close to the folded edge. 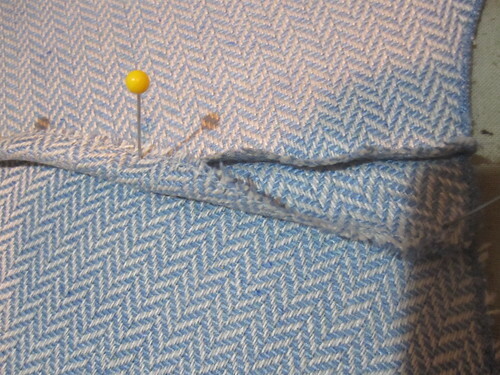 For topstitching close to an edge, I find it easier to click the needle over rather than try to run the foot close to the edge. Here I have it one click over to the left. The end result looks good from both sides, perfect for a pattern where the wrong side is sometimes the right side. As drafted, this pattern is sort of a faux wrap dress, or something like that. At any rate, it's not meant to have ties that go through an opening and wrap around. There are supposed to be weird small string ties on the inside, and then you wrap an unattached sash around the waist. The reviewers generally complained that it was difficult to keep the dress closed. After getting it assembled, I determined there was no discernible reason this could not be a regular wrap dress, so I decided to go the traditional route. To attach the tie, I stitched it right sides together with the front opening edge, placing it at the notch where the seam allowance still remained (see the photo above showing the rolled-hem finish above the waist). Then I serger finished the edge, including the tie. Next, I double-folded and pressed the front opening edge from the tie down, and topstitched the folded under edge in place. I am pretty proud of how seamlessly (for lack of a better, less literal word!) 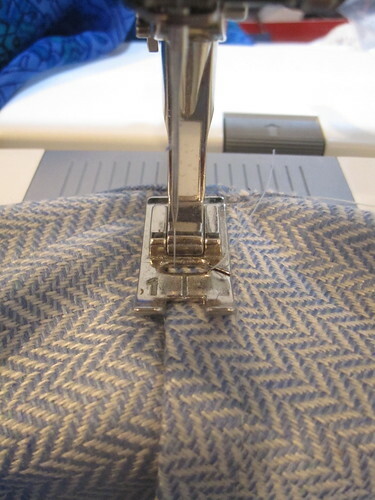 the front opening edge transitions from the serger rolled edge to the tie and finished lower edge. The back yoke is also meant to be lined. It was a tight squeeze, but I was able to burrito it for a clean finish. If you are facing the flounce, I wouldn't risk trying the burrito method. To keep the back neck stable while supporting the weight of the collar, I interfaced it. I also put a square of interfacing on the shoulder/neckline corner of the front piece with integrated collar to reinforce. You have to clip all the way to the stitching to get a nice corner. The hem is just turned under and machine blind-stitched, but I used hem lace at the sleeves because I didn't have quite enough fabric for a good hem allowance. It ends up being a nice touch. I first made this pattern in 2007 and always planned to return to it. It's a gorgeous style, and unusual. The neckline with little cut-on collar is remarkably similar to this insanely beautiful L'Wren Scott (a more brightly-lit runway shot shows two rows of decorative buttons down the front--for which I do not care--and princess seams). 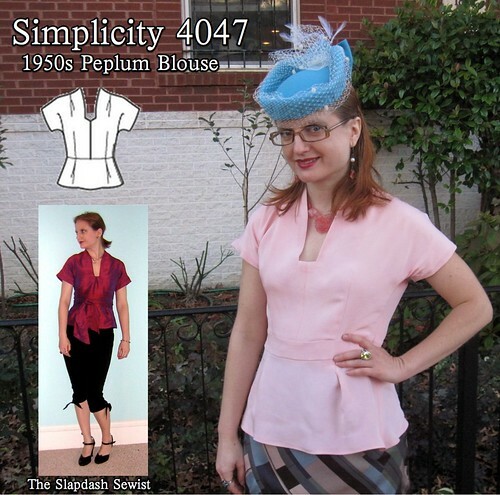 One thing I really like about the Simplicity neckline is that the centers have an inward curve. Very graceful. 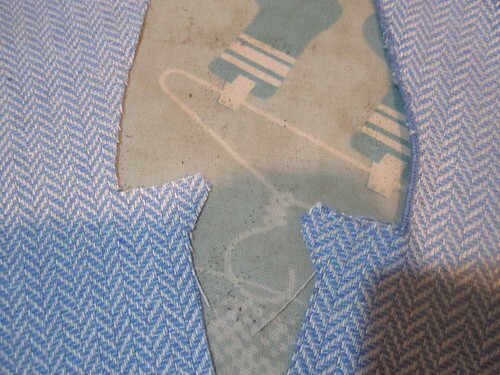 When I pulled out the pattern pieces, I was first struck cut this out along the smallest size line. 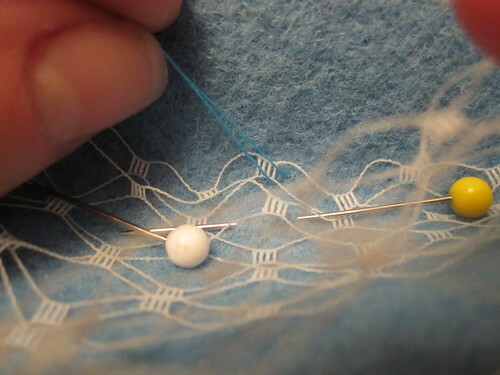 When my mom taught me to sew, she made me cut out the pattern along the largest size line, pin it to the tissue at the desired size, and then cut underneath the tissue at the desired size. I truly HATED this. Cutting is hard enough, but cutting underneath the tissue at the precisely the right spot was just horrible. So when I started buying my own patterns, I just cut them out at the right size. Well, then came the day when I realized I likely wouldn't be the same size forever, and that perhaps it might make sense to preserve the larger sizes. Don't you hate it when your mom is right? Anyway, I just added random increments of width at the waist and hip. 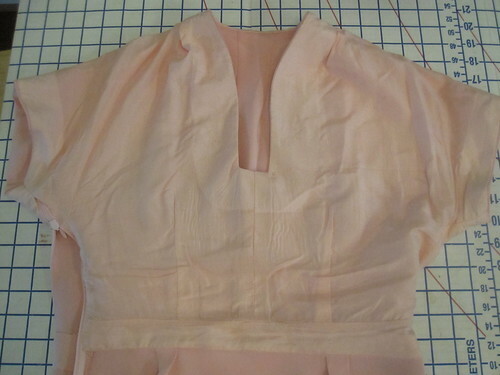 The other thing was that about 1 1/2 inches of length had been folded out of the upper bodice front and back. It seemed odd, as I usually don't have to shorten above the waist due to my long torso (yes, my legs really are that short; you should see me running), but I figured I must have had a reason. 1 1/2 inches seemed way too much so I reduced it to 1 inch and went on my merry way. Why, self of 2007? Why did you screw me like that? If anything, this could stand to have 1/2 inch of *additional* length. So I got this put together and the upper bodice was ridiculously short. The waist line is supposed to hit approximately at natural waist, and this was practically an Empire line. Why, I ask again, why? Ugh. I found a piece of scrap large enough to cut out a waist insert 2 1/2 inches wide (including seam allowances). In the end, the waist insert is a nice design feature, but it was way more trouble than it ought to have been. The key to the neckline is clipping all the way to the stitching at the corner, and trimming the seam allowance at the center. I am pretty happy with the sharpness. The corners are good and fairly sharp. The only issue is there is still a tiny bit of wrinkling underneath the corners. One thing I did remember from making this the first time is that I desperately needed a broad back adjustment. The first version of this was from a shreddy dupioni, and the fabric disintegrated at the darts the first time I wore it because I didn't have enough movement across the back. I did not know what I needed then, but luckily through the magic of the internet I now know how to fix the problem. I now have plenty of movement at the expense of a fairly unsightly back view where the excess ease sits when I lower my arms; I consider this a worthwhile trade. Another thing I remembered was that the facings were horrible. This really must be lined. 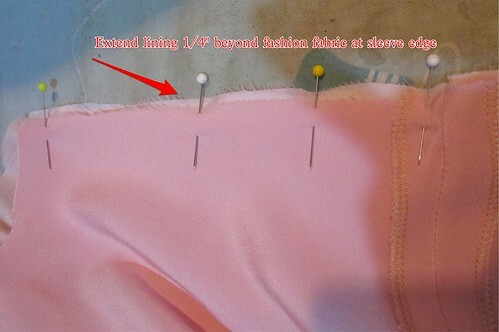 I lined only the upper bodice, and stitched the lining to the seam allowance at the waistline by hand. 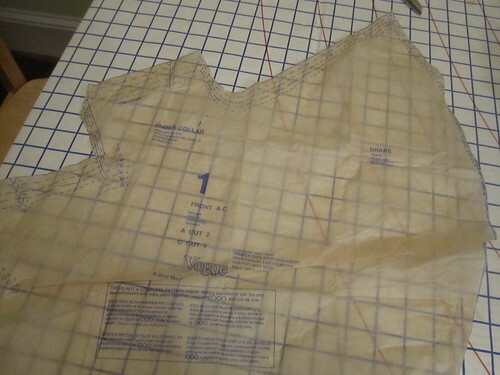 To make sure that the neckline would be crisp, I used the facing pieces to interface the edges of lining. I should not have interfaced the sleeve edge, as it is a little too stiff and the various seam allowances show through a bit. However, it worked well for the neckline. I stitched the edges of the interfacing down, so that if the glue unadheres the interfacing won't flap around inside. 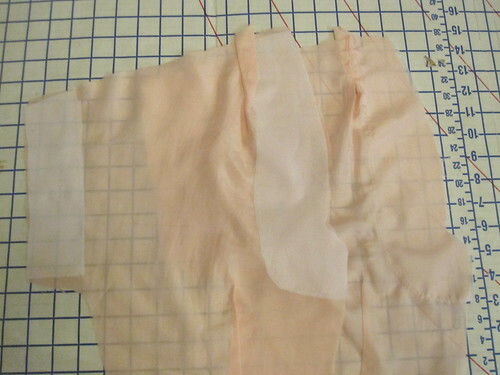 To get a nice turn of cloth at the armscye, I pinned the lining 1/8" beyond the fashion fabric when I was sewing them. 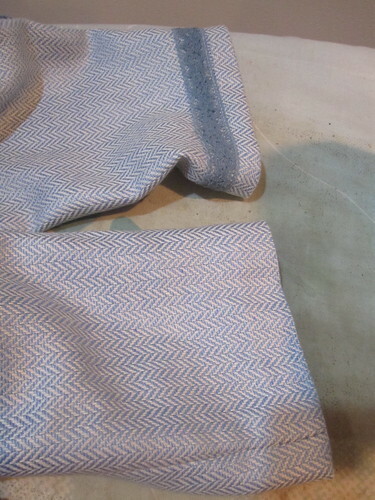 When the lining was turned to the inside, that pulled the fashion fabric in so there is no chance of the lining showing. This blouse falls toward the back at the shoulders, which is not a common problem for me. I have to shrug it up toward the front to get the shoulder seam to run along the shoulder ridge before I can move my arms. Is this a function of the dolman sleeve? If I were to consider fixing this in the pattern, would I just move some fabric to the front from the back, or would I affirmatively add more to the front? Wisdom and suggestions appreciated. I think I would like to draft this into a regular armscye so I could make a sleeved top or dress from the pattern. 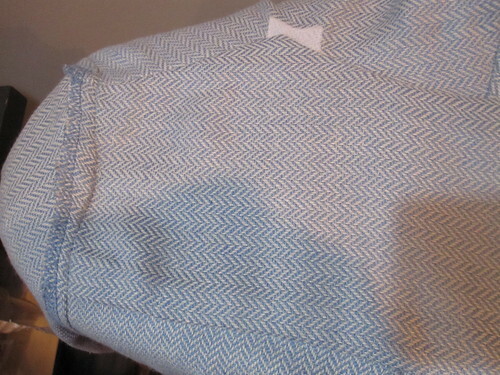 The skirt I'm wearing it with had a really dated handkerchief hem. This was during the PR Refashion contest and the fabric is a really lovely silk (purchased at H&M if you can believe, about 7 or 8 years ago). I was thinking of making it into a tank. It was going to be tricky because the skirt is bias cut. But then I realized it would be much easier (and likely more successful) to just change the ugly hemline. Ta da! New skirt. 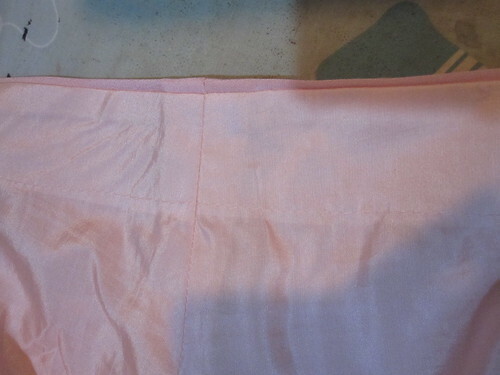 I bought this blush silk crepe many years ago, I don't remember exactly from where (FFC?) and how much I paid. I let it lie fallow for many years because I thought I couldn't wear this color--too close to my skin tone. However, I suddenly decided that it was the perfect color for me and I had to make the blouse immediately. I don't know why. I do like the color; it works a lot better for me than I thought it would. This was my costume change for the Tweed Ride. I also wore my Nana's fur collar coat, which I'd never worn. Even though I had nothing to do with the fur, I just can't bring myself to wear it. It is a beautiful coat, though, and it fits me so well! 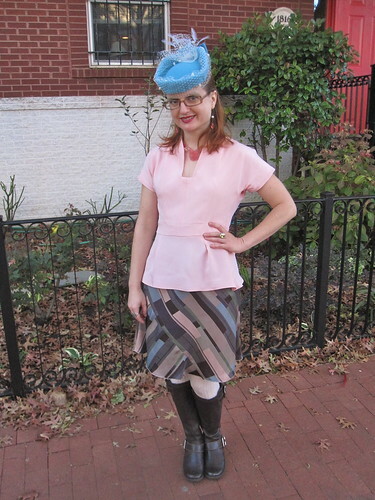 The main point of the costume change was to wear the other hat I made! This one I blocked from a length of wool felt. 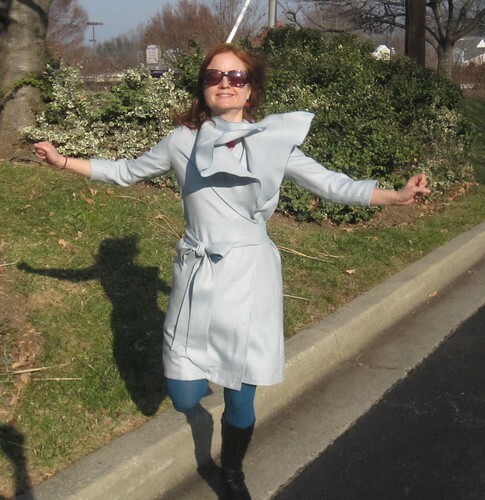 As sewists, we know how awesome it is to go from a flat piece of fabric to a 3D garment. It was very cool to do this in a new way. I gleaned most of my information from this video, and then just sort of made up the rest. I cut off three of the square edges and used the fourth one to fold into a kind of origami back piece, accented with a faux bow. 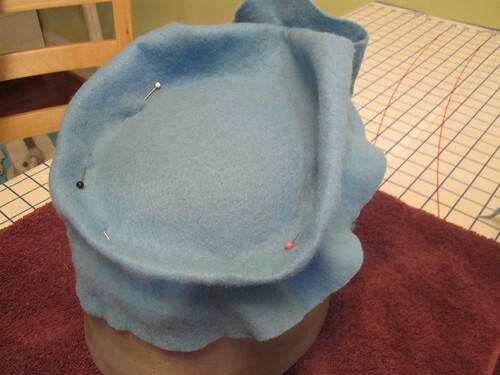 Here it is after I spent a lot of time stretching the felt around the head form to give it a conical shape, and then the initial blocking. I was just making up the shape as I went along. 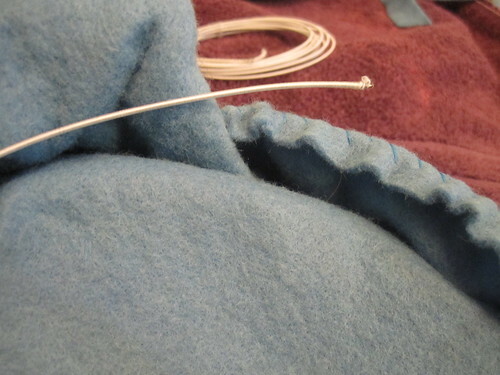 I hand stitched the wire in place to help it keep its shape (felt stiffener is really what ensures it stays in shape). 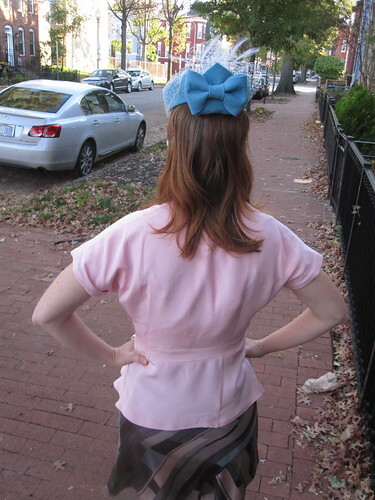 Because I don't have a hat form suitable for blocking, I just had to use my head form. The edge is pretty ugly--not at all smooth--because I couldn't stretch the wool underneath a block. I didn't have any matching ribbon to wrap around the edge and cover the ugliness. But I really don't care--I am over the moon about this hat! 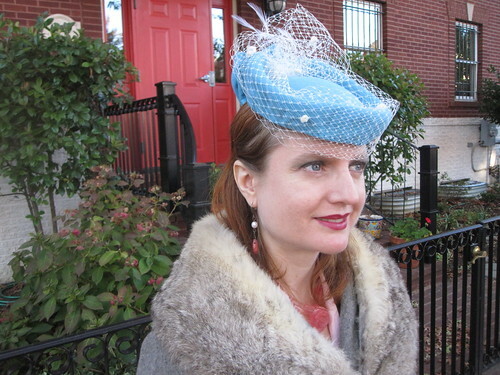 I've wanted a hat with netting my whole life , for some reason, and this one was well-suited to it. I don't know how you're actually supposed to attach netting, but I did it with tiny hand stitches anchoring it in place, as demonstrated in the photo. You can see completed stitches here. 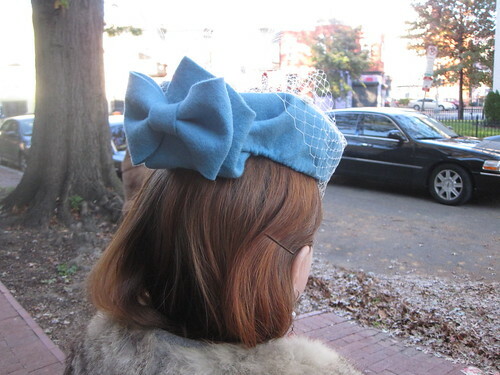 Millinery photos are here, along with some closeups of the houndstooth hat.